Astronomers have used powerful adaptive optics technology at the W. M. Keck Observatory in Hawaii to reveal the precise locations and environments of a pair of supermassive black holes at the center of an ongoing collision between two galaxies 300 million light-years away. The new observations of the galaxy merger known as NGC 6240 reveal that each of the black holes resides at the center of a rotating disk of stars and is surrounded by a cloud of young star clusters formed in the merger, said Claire Max, professor of astronomy and astrophysics at the University of California, Santa Cruz. "People had observed this pair of colliding galaxies at different wavelengths and seen what they thought were the black holes, but it's been very hard to make sense of how the observations at various wavelengths correspond to each other," Max said. "The adaptive optics results enabled us to tie it all together, so now we can really see it all--the hot dust in the infrared, the stars in the visible and infrared, and the x-rays and radio emissions coming from right around the black holes." Adaptive optics (AO) enables astronomers to counteract the blurring effects of turbulence in Earth's atmosphere, which degrades images seen by ground-based telescopes. Max, who directs the Center for Adaptive Optics at UC Santa Cruz, is the lead author of a paper describing the new findings published by the journal Science (Science Express online, May 17, and in a later print edition). Her coauthors are Gabriela Canalizo, who worked with Max as a postdoctoral researcher at Lawrence Livermore National Laboratory (LLNL) and is now at UC Riverside, and Willem de Vries, a physicist with LLNL and UC Davis. Images of NGC 6240 in visible light from the Hubble Space Telescope show the outer parts of the colliding galaxies distorted by their ongoing merger into long tidal tails of stars, gas, and dust. 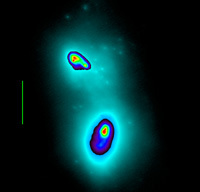 In the bright central region, two distinct nuclei can be discerned, but clouds of dust obscure much of the visible light from the core. The presence of two supermassive black holes in NGC 6240 was first demonstrated by x-ray observations from NASA's Chandra X-ray Observatory in 2002. Two pointlike radio sources were also detected in the central region. But trying to match up the data from one instrument with those obtained at different wavelengths by other instruments is very difficult because there are few common reference points in the various wavelength regimes, Max said. The infrared images her group obtained using the AO system on the 10-meter Keck II Telescope provided the high spatial resolution needed to identify features in NGC 6240 that can be seen in different wavelengths. "With the infrared images we got at Keck, we were able to line up the information from all the different wavelengths to determine which features in the images are the black holes," Max said. The infrared wavelengths are less affected by dust than visible light, and the Keck infrared images show distinct nuclei with complex substructure surrounded by many faint point sources. The faint point sources are young star clusters produced in a burst of star formation triggered by the collision of the two gas-rich galaxies. Pinpointing which of the features in the infrared images correspond to the positions of the black holes involved several steps and required Keck adaptive optics observations at different infrared wavelengths. "We uncovered it piece by piece, until we were able to make the correspondence between the black holes and the features seen at different wavelengths, as well as the stuff around them," Max said. "It really shows how powerful the Keck adaptive optics system is. We were also fortunate to have an extraordinarily good observing night." Galaxy mergers are thought to play a major role in the evolution of galaxies and may help explain many of their properties. For example, astronomers have found that the mass of the black hole at the center of a galaxy is highly correlated with large-scale properties of the galaxy itself. The "coevolution" hypothesis explains this correlation as the result of both the black hole and the galaxy around it growing incrementally in repeated merger events over cosmic timescales. "The gravitational influence of the black hole is actually limited to a relatively small region right around it, so how can it affect the rest of the galaxy? But if the black hole and the galaxy around it evolved together through the same sequence of merger events, that would explain the correlations," Max said. "That's why people are so excited about understanding galaxy mergers, and here we're seeing it in action." The two black holes in NGC 6240 will eventually, in 10 million to 100 million years, spiral into each other and merge, producing a powerful burst of gravitational radiation, she said. This research was supported in part by Lawrence Livermore National Laboratory under the auspices of the U.S. Department of Energy and by the Center for Adaptive Optics, a National Science Foundation Science and Technology Center managed by UC Santa Cruz. The W. M. Keck Observatory is operated as a scientific partnership among the California Institute of Technology, the University of California, and NASA. Note to reporters: You may contact Max at (831) 459-2049 or max@ucolick.org.